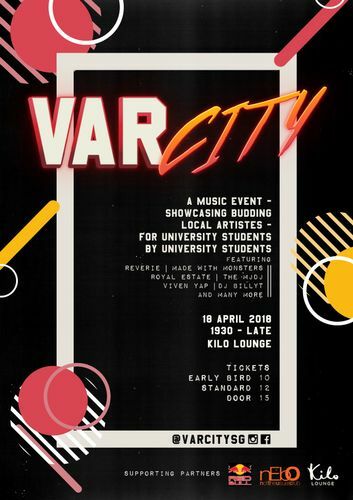 VarCity SG, an inter-collegiate musical event, showcases budding artistes from universities in Singapore for its inaugural year. The brainchild of a team of students from Singapore Institute of Management – University at Buffalo (SIM-UB), VarCity SG aims to provide a platform for emerging young artistes to perform and expand their audience reach, for students to gain hands-on experience in managing a music event and to foster a tighter knit community amongst undergraduates in Singapore. The event promises an exciting line-up featuring students from Singapore Management University, Singapore Institute of Management, Nanyang Technological University and National University of Singapore, such as DJ BillyT. A part of AOS collective, this young undergraduate is no stranger in Singapore’s disc jockey scene and spins regularly at Singapore’s top clubs and lounges. Up and coming artistes, Royal Estate and Vivien Yap will also be performing at VarCity SG. Having recently performed for Urban Ventures and Noise Singapore, these two highly anticipated acts are making their mark in Singapore’s music scene. Other acts to look out for include Reverie, an all-girl quartet that specializes in performing sweet melodies and romantic ballads and The MJDJ, a diverse cast of musical talents with a signature chill-out sound. Made With Monsters, DJ Drujo, and DJ Bandung are also amongst the list of emerging artistes performing during the event and are not to be missed. All university students are warmly welcome to attend. Tickets sales begin on 30th March and can be purchased through VarCity SG’s social media platforms, such as Facebook and Instagram.